Donna Marie Christian-Christensen, the non-voting delegate from the U.S. Virgin Islands to the United States House of Representatives, was born in Teaneck, Monmouth Country, New Jersey on September 19, 1945 to the late Judge Almeric Christian and Virginia Sterling Christian. Christensen attended St. Mary’s College in Notre Dame, Indiana, where she received her Bachelor of Science in 1966. She then earned her M.D. degree from George Washington University School of Medicine in Washington, D.C. in 1970. Christensen began her medical career in the U.S. Virgin Islands in 1975 as an emergency room physician at St. Croix Hospital. Between 1987 and 1988 she was medical director of the St. Croix Hospital and from 1988 to 1994 she was Commissioner of Health for the Virgin Island. During the entire period from 1977 to l996 Christensen maintained a private practice in family medicine. From 1992 to 1996 she was also a television journalist. Christensen also entered Virgin Island politics. As a member of the Democratic Party of the Virgin Islands, she has served as Democratic National Committeewoman, member of the Democratic Territorial Committee and Delegate to all the Democratic Conventions in 1984, 1988 and 1992. Christensen was also elected to the Virgin Islands Board of Education in 1984 and served for two years. 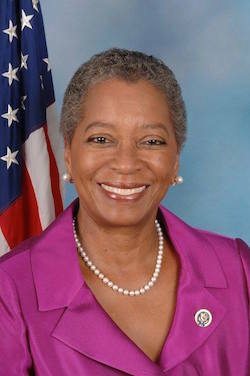 She served as a member of the Virgin Islands Status Commission from 1988 to 1992. In 1996 Christensen was elected as the non-voting delegate from the Virgin Islands in the United States Congress. Despite her non-voting status, she serves on various house committees including the Committee on Natural Resources, and the Committee on the Homeland Security Committee. She also chairs the Natural Resources Subcommittee on Insular Affairs. Delegate Christensen is a Member of the Congressional Black Caucus, the Congressional Caucus for Women’s Issues; the Congressional Travel and Tourism Caucus; the Congressional Rural Caucus, the Friends of the Caribbean Caucus; the Coastal Caucus and the Congressional National Guard and Reserve Caucus. Christensen is also a member of the National Medical Association, the Virgin Islands Medical Society, the Caribbean Studies Association, the Caribbean Youth Organization and the Virgin Islands Medical Institute. She is the mother of two daughters, Rabiah Green-George and Karida Green. Congresswoman Christensen also gained two new daughters, Lisa and Esther, and two sons, Bryan and David, through her 1998 marriage to Chris Christensen. http://bioguide.congress.gov/scripts/biodisplay.pl?index=C000380 ; Biographical Directory of Donna Christensen http://www.donnachristensen.house.gov/SinglePage.aspx?NewsID=1248.